Testing is one of the most integral parts of any product development and maintains product quality. 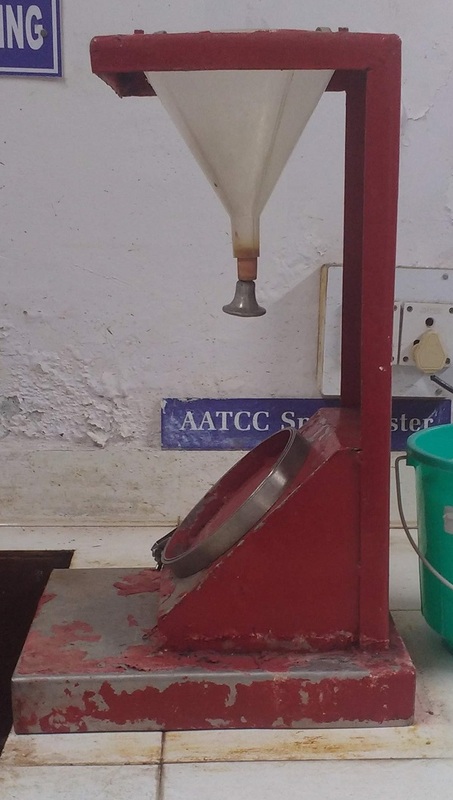 The results indicate how well the product will stand against the effect of time, how will the product differ from when it was produced, will the product be able to fulfil its purpose. But most importantly is the product made up to its required specifications? In this article, we are going to discuss the various testing equipment/apparatus that are being used for certifying quality levels of different fabrics being tested. 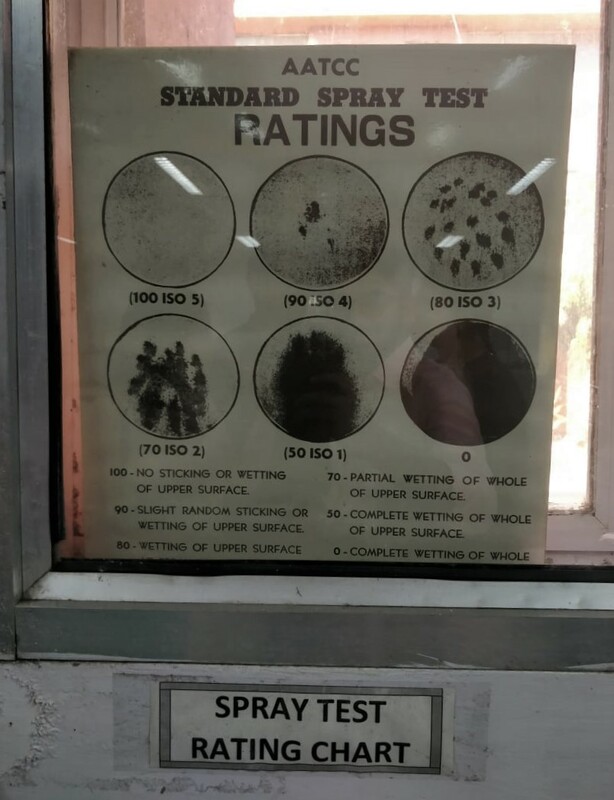 During a recent visit to a textile laboratory, I was amazed by the number of tests through which a quality fabric has to pass before it is to be converted to a garment. Below are the comprised details of the various testing equipment used in fabric testing laboratory. This test is used as a general guide to determine the strength of any fabric. It is done by putting the sample in a mould through which pressure is applied from the bottom of the fabric which after its threshold point explodes. Parameters such as speed, duration, severity are recorded when the sample explodes. Bursting strength is usually quoted in kPa. 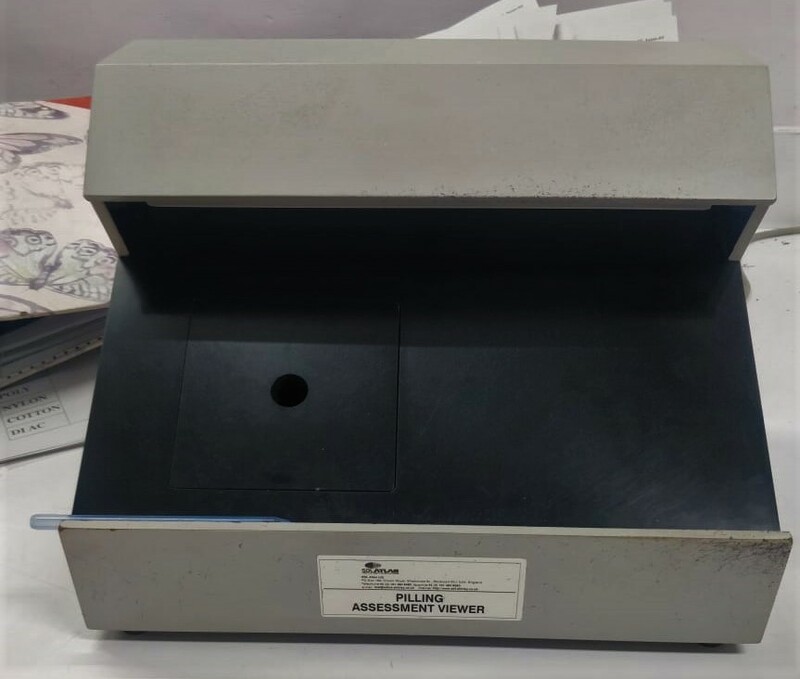 This testing equipment is designed to check for the color fastness of any textile material due to rubbing. It determines the amount of color transferred from one fabric surface to another. It is mostly done for textile material like fabrics which are dyed, printed or in any way colored. 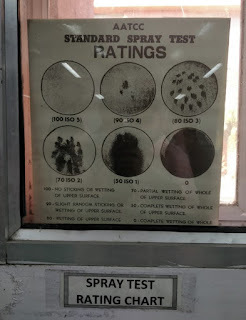 The test is carried out by continuous rubbing of the sample against an undyed sample. The color transferred is then checked against a predefined grey scale and the score is allocated accordingly. This test is done on two different stages of the fabric, once in the dry state and again repeated when wet. The result varies with the different types of dyes and fabric being used for the testing. 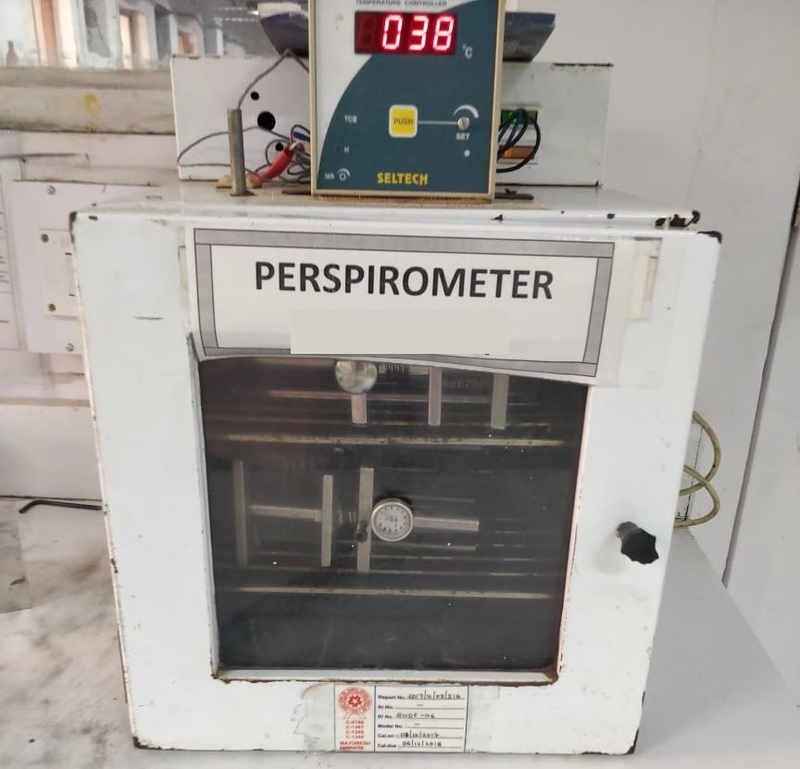 Weatherometer testing of fabric has been one of the most growing tests that are going on in the industry. It works on the principle of accelerated ageing which is created artificially inside the machine. A few minutes in the machine can depict a certain span of actual outdoor atmospheric changes endured by the fabric. 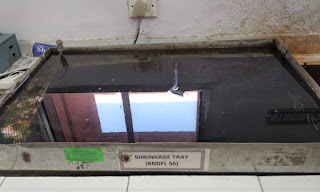 A combination of artificial light (UV light), heat, specific filters, very actually monitored radiations, controlled atmosphere (temperature and humidity) along with cycled light, dark and rainy conditions can be created inside the machine. The results can be compared with the original sample for the changes and graded accordingly. This is one of the most common tests required for the fabric. It replicates the pilling or snagging on fabrics due to normal wear. 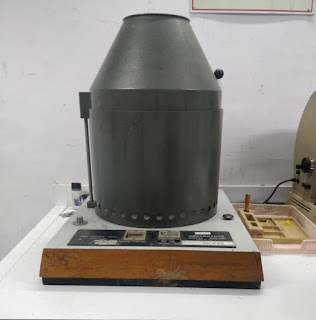 The inside of the machine is made of cork with mild abrasion and the samples are left to rub against the surface which results in the formation of pills. After the test, the fabric is assessed and grading is done ranging from no or very weak formation of pills to severe formation of pills with reference to predetermined pilled samples or its pictures. For different types of fabrics and order requirement, the number and timing of the cycle vary. It is mainly performed for knitted fabrics. 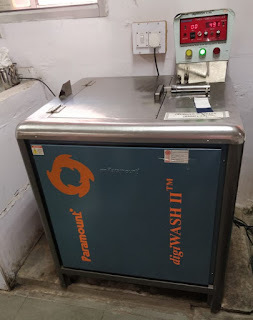 It is a laboratory instrument used for conducting accelerated laundering and or dyeing tests. It can be used for performing washing, dry cleaning, dyeing, detergency, and other laboratory tests. Inside the container parameters like temperature, mechanical agitation can be controlled and recorded for optimal testing and grading. This is most useful because it can depict various washing condition required for different types of fabric. It is testing equipment which is used to test the water repellency of a fabric sample. For testing a small shower of water is sprayed over the fabric which is kept at a certain angle. 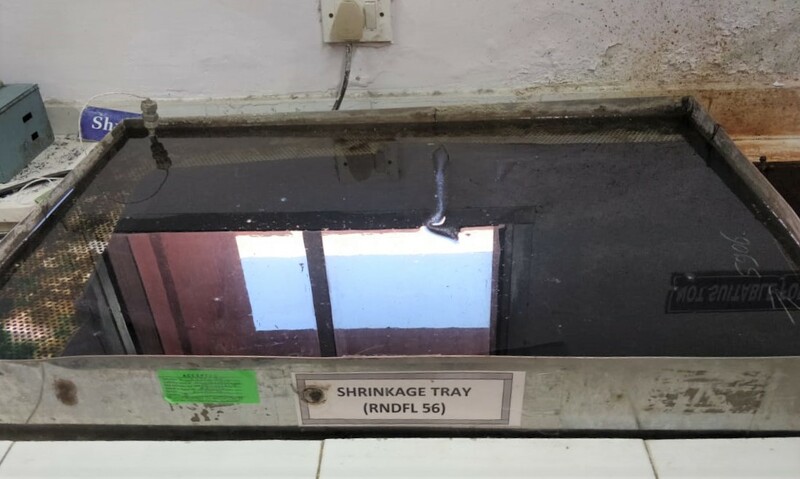 From there the amount of water retained and soaked on the fabric is measured and compared from a predefined rating chart which is then graded accordingly. Perspiration is often responsible for the change in color of the fabric. 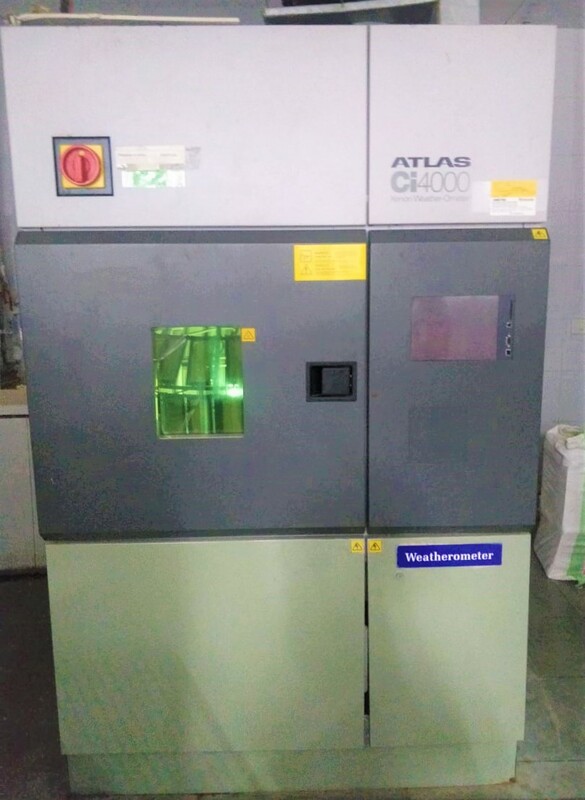 It is testing equipment which is used to determine color fastness of dyed or printed fabric against perspiration due to water, sea water etc. and sublimations during storage. 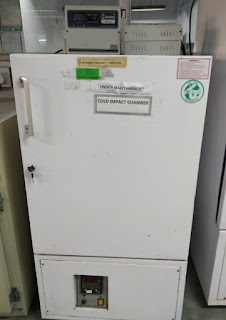 It is carried on by exposing the fabric sample to the action of the both acidic and alkaline medium in a controlled temperature and pressure along with an undyed sample. From there the fastness is measured by comparing the sample through a shade card. Tear strength is the tensile force required to rupture a pre-slit woven fabric sample under controlled conditions and is determined by measuring the work done in tearing the fabric through a fixed distance. The tearing strength is measured in newton(N) or centinewton(CN). The apparatus consists of a pendulum carrying a clamp and is aligned with a fixed clamp. The procedure starts with raising the pendulum. Upon raising the sample fabric is placed between both the clamps. On releasing the pendulum the fabric tears from the already slit point as the moving clamp move away from the fixed clamp. 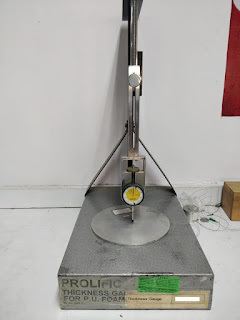 There is a pointer attached to the pendulum which is graduated to read the tearing force directly. 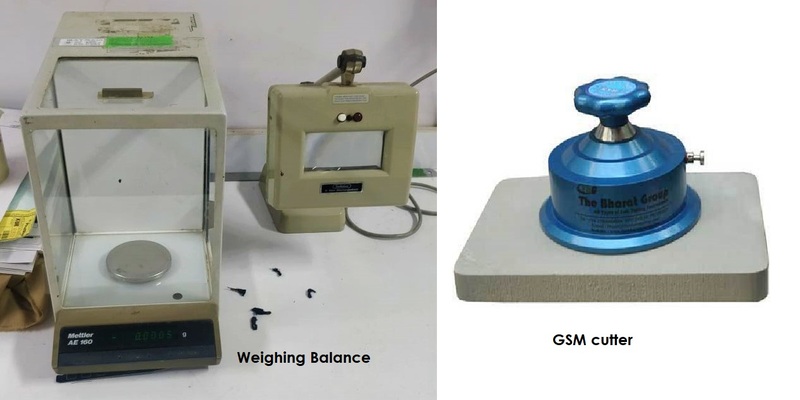 GSM stands for Gram per Square Meter and as the name suggests, is the identification of the weight of the fabric which includes knit, woven as well as non-woven. 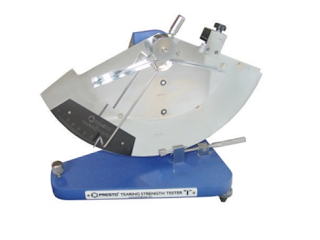 It is a simple instrument which is used to cut a fabric sample for calculating the gsm of the fabric. The cutting diameter of the fabric sample is of 11.2 cm. After cutting the sample is then weighed and calculated for GSM. Crease in a fabric during wear is something which is very much undesirable for the aesthetic look of it. The apparatus consists of a circular scale measuring the recovery angle with a stand at the centre for the fabric to be placed. For the test, the fabric is first creased and then left to recover for one minute and the recovery angle is recorded. 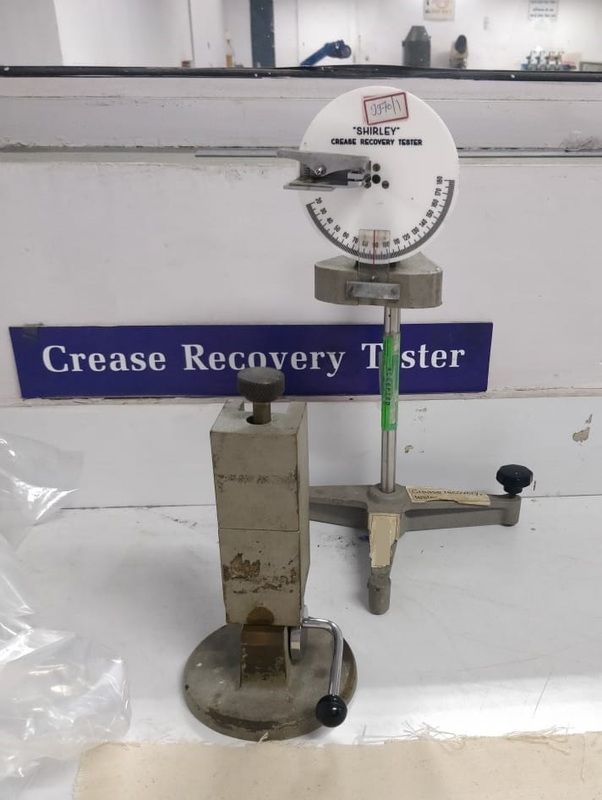 Higher the recovery angle is, the more will be the resistance against creasing. This is done both in warp as well as weft direction. Parameters like load (for creasing the sample), time of creasing and recovery time can be altered for different cases. It is a simple instrument used to measure the thickness of the fabric. At present, most of the instruments are digital and placing the fabric between the anvil and the pressure foot would give the thickness of the fabric on the screen. The thickness is measured in millimetres (mm). 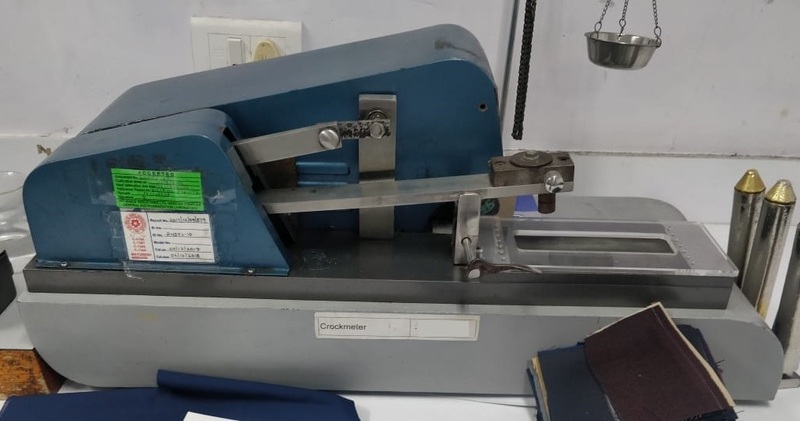 An extensometer is a device that is used to measure any change in the length of the fabric sample when under stretch or during recovery from that stretch of the fabric. it can be done both for woven and knitted fabrics. 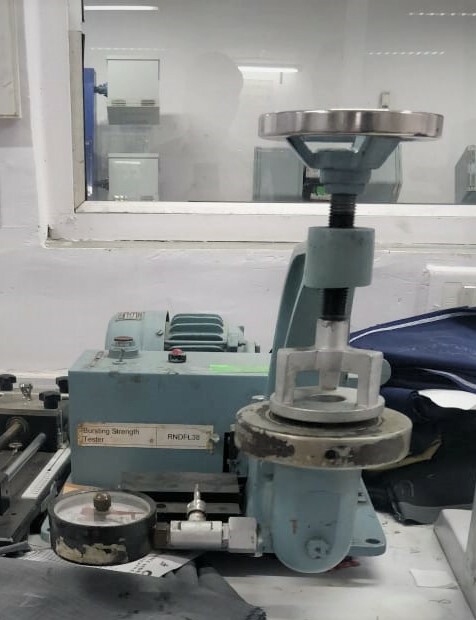 The instrument consists of a loading frame with clamps and screws tension device along with various weights which can be used to applying stretch to the fabric sample. The fabric elastic which is one of the most important properties of the fabric can be determined at different extensions can be determined through this instrument. 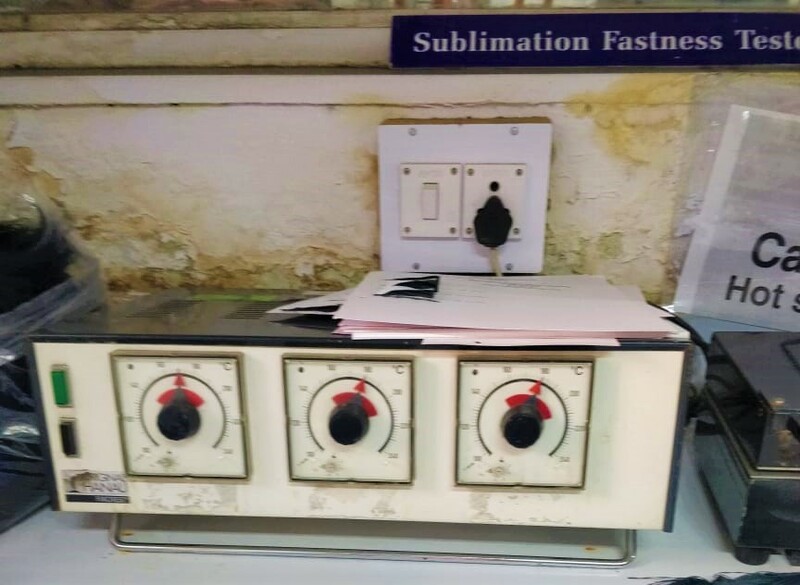 Sublimation tester is an instrument used to determine fabric ironing color fastness, sublimation color fastness, and dimensional stability under hot dry conditions. 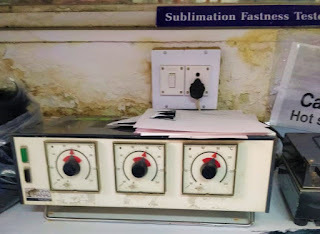 Parameters like heating plate temperature, test timings can be controlled depending upon the requirements. The sample preparation can be done for just fibers, yarn or fabric. The results are then analyzed and rated based on the grey cards to evaluate discoloration of the original sample and staining degree of white cloth. Light fastness or color fastness to light is the resistance of the dyes or pigments used for coloration to tinting or change in color due to exposure in direct sunlight or any artificial light source. Different end uses of fabric will require different levels of fastness towards the light. Since artificial sunlight cannot be replicated or controlled in a laboratory environment, a xenon arc lamp is used which simulate UV and visible solar radiation. It also provides the best method for simulating the accelerated light aging of a fabric sample and measures the level of color fastness based on a shade card. Testing is done for both warp-wise and weft-wise directions and recorded after which the average is found out for the most accurate result. 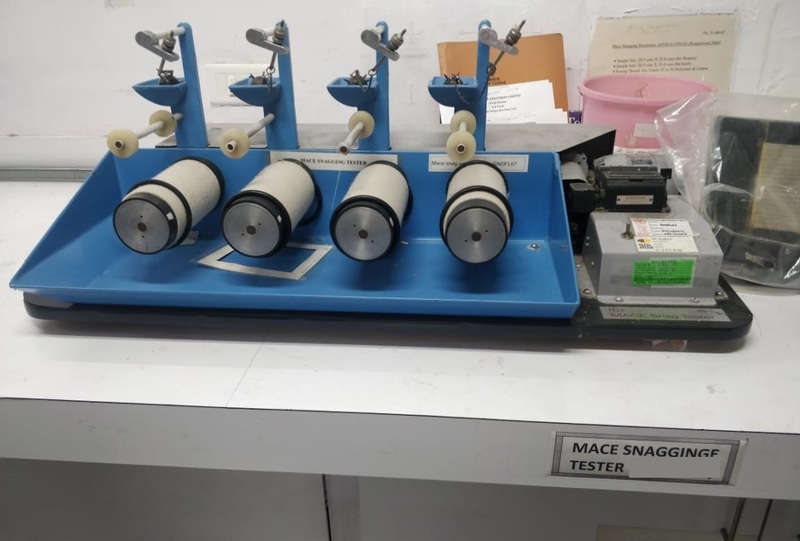 Mace snag tester is a testing apparatus used to determine the tendency of the fabric to snag (pull yarn loops from fabric) during normal wear. 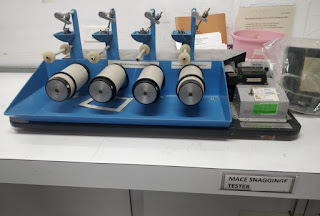 The machine is equipped with spiked mace balls which snags over rollers on which fabric samples are sleeved upon. The number of rotations is controlled depending on the fabric and requirements. The finally snagged fabric is then compared and rated according to various snagged levels. Most of the fabric, when exposed to very cold temperature over a period of the time, shows a change in the physical properties. The changes can be seen as the fabric becomes hard and brittle. This testing equipment is designed to study the effect of extreme cold temperature on textile fabrics as the machine can achieve temperature as low as -400 C.
About the Author: Soumyadeep Saha is a graduate in Apparel Production and is currently pursuing his Master degree in Fashion Technology from NIFT, New Delhi. He is interested in Quality Assurance. Most common fabric testing requirement and testing equipment. 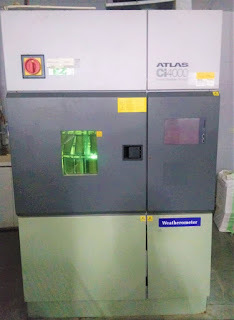 Image of the fabric testing equipment.